The schematic simplicity of this landscape approaches abstraction, with only the tentative contours of the trees revealing familiar figurative shapes. The darkest area of this painting is also the deepest: the receding trunks and the nearly black, murky space in-between recreate the sense of a proper, deep forest, where one can easily get lost, yet at the same time is curiously, almost mystically attracted. The lightest area, above the foliage, is surprisingly flat, and resembles an irregular puzzle. The generous depth of the forest and the abstract blue and white stripes that depict the sky produce a contrast, a contrast that is being mediated by the tapering tree crowns. Their triangular shapes become lighter towards the vertex, as they absorb the light and the atmosphere. The cool sky also offsets the intensely saturated yellowish color of the very foreground, where the surface reflects the light back into space with a dazzling impressionistic effect. 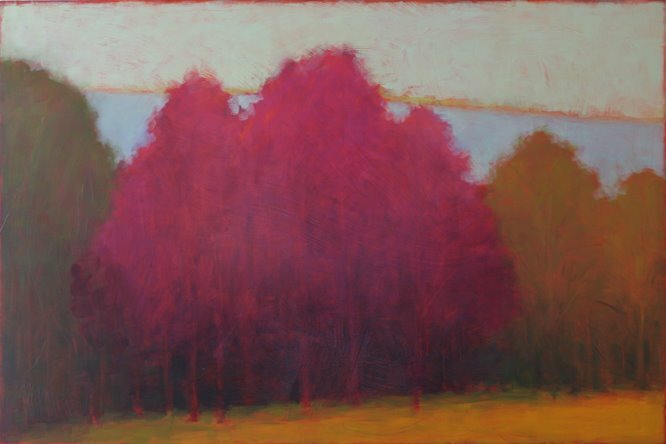 The framing stripes of the sky and of the ground have a compositional role as well: as they broaden towards the right, and appear to “squeeze” the dark grove, rendering the trees smaller, they create the effect of an overall, global perspective. Colors and shapes may dominate this piece, but perspective lends it dynamism, however measured and subtle. It invokes a vanishing point in our mind’s eye. The triangles of the tree tops form a toothed ornament complemented by the blue&white mirroring pattern. Most of the “teeth” are either below or above the horizontal axis; they dictate a varying geometrical tracery, upholding viewing interest in a more abstract vein. Eventually, the resulting interplay of uneven dark and light geometrical forms, all described by blurred, untidy contours, generates a sense of motion, and brings to mind the slow swaying of trees as they capture the wind between the branches.